I always loved the Contra/Probotector series and this is possibly as close as the Master System came to having a game that fills those gigantic, destructive, steel toed boots. Essentially you run, or rather stomp - Robocop is a bit of a big metal lug, About delta city and other Robocop/terminator themed areas peeling the wigs of characters from both sides of the cross-over. 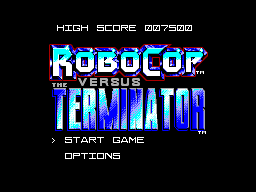 You'll be fighting street punks, gun turrets, terminators and ED 209 from the get go, and, lordy lou, there will be blood. Enemies literallty burst, thier heads spinning off in a sprinkler system of grue, and if this doesn't get you interested you'll be utilising lasers, rocket launchers, and Robocop's own modifed MGC M93R-AP, although the latter sounds more like a wet spud gun for some reason. So all of this is sounding pure class so far, right? Well you'd be right in thinking so. 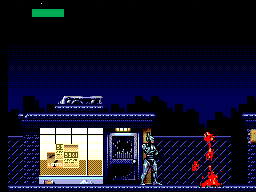 You got two of the 80's coolest cybernetic icons kickin' the ciruits boards outa each other and torrents of bullets and blood flying all over the shop. But there are, as always, some down sides to the coolness. Firstly enemies always take the same amount of hits to kill no matter which weapon you have, so when you reach a terminator, which can take 2 or three shots to kill depending on wether they have skin or not, and you got yourself a fat rocket launcher you'd be expecting to blow that sucka through a wall right? Wrong, he's still taking those 2 to 3 shots to kill. Secondly there is that cool sounding three blast gun of Robocop's that here, as mentioned, sounds like a weak pellet gun full of sponge pudding, and fires just one bullet - not technically true to the films original vision unfortunately. Then there's the bullet's themselves: for most part the game is virtually free of flicker that is other than the bullets, and obviously seeing where them bad boys are flying is going to be essential to your survival at more than a few points in the game, but often you'll be hit in the tin can from nowhere by a flickery invisi-bullet. Bad news. Also this flicker happens when you kill a boss making your victory just that bit less mighty feeling. However it's not the bosses or the enemies that'll be causing you the majority of the grief you'll be subject to throughout the game, No, said greif will come to you in the form of the odd fire pit which kills you instantly or toxic waste that is a real pain to dodge or falling boulders that, again, kill you dead after one hit. I seem to remember Clarence Bodicker's mate (that guy who ended up playing the devil in the series Reaper) dropping a ton of scrap steel on Robocop and he still manages a nasty neck jab on old Clarence - so why would a mangy green boulder have you off? I don't know the answer to that crappy conundrum, but I do hate 'one-hit dead' stuff that looks as though it couldn't kill a badly mangled ferret - I hate one hit dead stuff full stop, man. However, overall, even though there is a big fat list of stuff that'll grate your cheddar the game is still compelling to play every now and again. Sure it's basic, but you can't beat being Murphy and blasting some eyebrows off. Although it would have been cool being Arnie at some point...oh well. By far some of the best graphics on the system - you got tons of detail, excellent, excellent animation and ton's of stuff to blast and destroy. That's right not only do you get to split the skulls of some Delta City, OCP hired, street punks and turn them into awesome human fountains of ketchup, but you can blast background items such as windows, barrels and TV's (which in turn will drop baby food - robocops favourite chow - beef and carrot I believe, or sometimes it will drop petrol bombs)! It's not often such attention to detail was lavished over a an 8bit title as far as graphics go but this truly, truly pushed the boundaries of what was possible on the master system, showing that even at the time it's market life ended there was still much to be squeezed out of the chunky black box. Now back to that animation: Robocop looks really cool, not only is he fully in proportion and look as masterful as he does in the movies (except number three where Weller dropped out in favour of that slightly stumpier looking dude. ), but his movements are fully convincing and this translates to most of the other elements of the game. ED 209 is suitably robust and stompy looking as is Robocop 2 (Caine). It's truly a triumph of the Master Systems graphical prowess. Not all bad, but just not great. The tunes are suitably futuristic sounding in that semi-industrial manner, but I feel that for all the graphical show that was going on the sound effects really suffered. I know I keep banging on about this but Robocop's gun sounds like bum, as does most of the other sound effects - fair enough we have a few vocal samples and what not, but i'd rather have dropped those and had the authentic sound of Murphy's blaster and some nice ED 209 Roars. Sadly this is one downfall of an otherwise solid, if rudimentary, title. There is no doubt that a few varied angushed screams from a splattered street punk would have done wonders for the brutality the game is obviously trying to push. Tight, tight, tight. 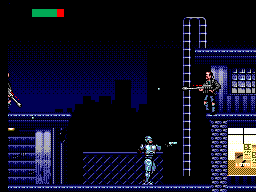 Robocop feels suitably stompy, solid and chunky to manouver, but don't let that misguide you: when you want to jump on a ladder or control your angle of descent you're in there with no porblems at all. Collision detection has a lot to do with this as clinking onto a highwire or a ladder is a simple snappy process but the controls are pure magic, so not only can you be launhcing yourself up a building but all the while you can be blitzing a terminator down below. This for me is where the magic of the game comes in - for all it get's ripped for being basic and repetative it is as tight as they come and that is something that is often lacking in lots of games, that may well have the variety this lacks, so to me it all levels out in the end. I've played through this time and time again. You can speed run it in under an hour if you get good enough at it, and although that might sound like a bad thing you'll have a blast getting that good, and it's fun to run through knowing what's coming and taking it out at top speed. With the sweet combo of controls, atmoshpere and graphics you can't help but enjoy the feel of playing an awesome cyborg with massive killing capacity - and that's the beauty of this game, it let's you do this with acurracy and panache. Wether or not you get as many kicks out of RCvT as I did obviously depends on how much you dig the characters (and I get the sneaking suspicion that this might have something to do with being around when the first films came out - not now when the crud they churn out in the name of the terminator, and other valued icons of the 80's, could boil your boys in thier bag with pure badness). However, not only will your love be based on the character but it's also how much you're willing to accept this game for what it is - a simple blaster that does what it does better than most games ever get close to doing. Genius. It's a solid experience from begining to end that looks great and runs as smooth as a silky sasquatch running through a forest of creamy custard...erm..yes. It's not going to revolutionise your world, and it's certainly not going to clean your bedroom or kill that big spide in your bath but then again...what the hell am I on about? Look, i'm not even sure anymore but this game will blow the skids out of your undies make no mistake. If you're looking to run and gun then this will sate your need for fast paced acts of violence with style and eye candy.